weep not for the past. Reason respects the differences, and imagination the similitudes of things. The great instrument of moral good is the imagination. the debt is due dust claims dust - and we die too. Familiar acts are beautiful through love. O, wind, if winter comes, can spring be far behind? the lawyer's jest, the hired assassin's trade. There is no real wealth but the labor of man. of the happiest and best minds. When my cats aren't happy, I'm not happy. they're just sitting there thinking up ways to get even. or expiating the mistakes of our youth. to cheer its own solitude with sweet sounds. and vices of men that make it a necessary evil. When all men are good and wise, government will of itself decay. Nothing wilts faster than laurels that have been rested upon. which consumes the scabbard that would contain it. The soul's joy lies in doing. who had money to be generous with, should be a stockbroker. Tragedy delights by affording a shadow of the pleasure which exists in pain. Music, when soft voices die Vibrates in the memory. Revenge is the naked idol of the worship of a semi-barbarous age. and makes familiar objects be as if they were not familiar. such a vow in both cases excludes us from all inquiry. the very crux of the problem. which it devours in secret. the pains and pleasures of his species must become his own. which can be adduced that some vast intellect animates Infinity. Peace is followed by disturbances; departure of evil men by their return. so that one may be happy in the interim. Thank you for visiting: "Look on my works, ye mighty, and despair!" 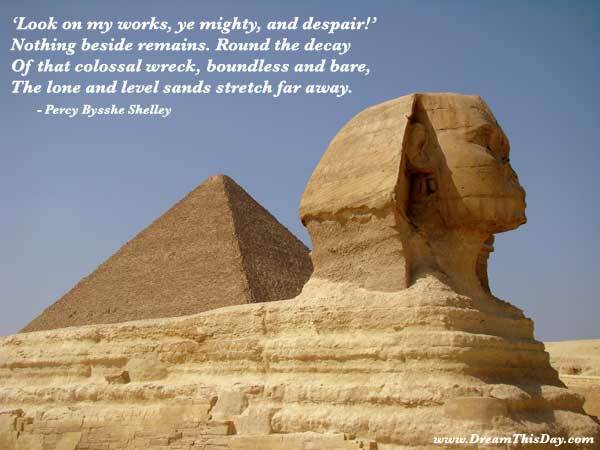 by Percy Bysshe Shelley.